The On-Stage GS7364 -- durable, highly portable, sleek and super-stable -- takes road-worthy, studio-ready adaptability to a whole new level. 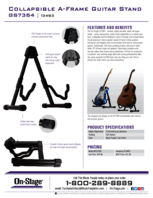 Collapsible and flat-folding for ease of storage and transportation, the all-aluminum, black powder coated A-Frame's three position locking pin and stepped yoke accommodate both electric and acoustic guitars. Additionally, EVA foam padding protects instrument finish, while 10 degree tilt-back angle and splayed, tripod legs (complete with non-slip rubber feet) ensure secure placement. Perfect for production companies' ever-evolving stage plans and touring professionals alike, the overly-versatile GS7364 does only one thing you can't find in almost any other stand: just about everything.